Android users are constantly keeping an eye on the latest news and leaks in order to remain up to date about the latest advancements in the android technologies. The developers are keen to provide new and innovative options to the customers so that they can optimally utilize sizzling applications for the tablets and smart phones. No storm could resist the software and application developers to device new solutions for the customers and offering them novel applications each day. Some people use applications for making the optimal usage of time while on the other hand some of them use it for informational purpose. The busy schedule of the people have resulted in the spreading several chronic diseases such as hypertension, blood pressure issues and other related ailments. 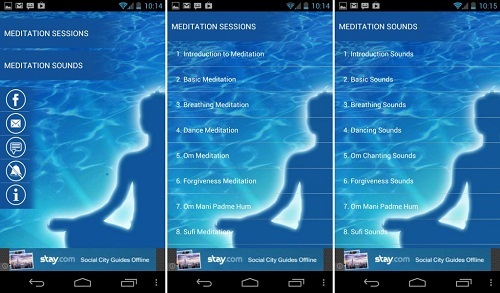 In order to relax the people, a latest android application has developed which provide audio guidance to the people regarding meditation techniques. In order to relax body and mind the soothing background music is also loaded in application which allows the user to feel comfortable. Sparsh can easily be downloaded for free from any of the application store. The traditional animated wallpapers are no longer appreciated by the users because of advancements in technology. They are continuously looking for the options that make Smartphone more alive. One of the efforts by application developers which support Android operating system is Art Particle Live Wallpaper which enables the people to decorate and design their home screen the way they want. Individuals can create fireworks, graphic patterns and other desired formations just by single touch. Most of the people are interested in learning new languages and are constantly looking for the platforms that allow them to practice these languages. With the efforts of application developers, it is now possible to learn as many languages as desired by means of Flitto application. The application further facilitate the people to access the accounts of major celebrities on Twitter and other social networking platforms and help them to understand their status updates in different languages. It is one of the serious problems of people that they forget the intake of medicines on time. This can not only lead to the disastrous results but can fatally harm them. Latest android application named as Rx Medicine Reminder is now available for the convenience of users which reminds them for medicines. The alarm option is also available in application which reminds people within the pre-specified times. The applications specified above are now easily available at application stores and can be downloaded for the affordable price range. People can simply visit the stores and search for the desired android applications.